Sassy Sara's Secrets: What Happened Jr??? Lola and I decided to up our bet from last week. Whoever's driver finished better this week would get a good prize. Almost like double or nothing. On the line was dinner, a ice cream cake from Cold Stone, $25 gift card from Sephora, $25 gift card from MAC, and a mani-pedi. Oh dear! Racing Gods please help Dale Jr. The weekend didn't start well. The rain came and qualifying was washed out. Things didn't look any better on Sunday. Unfortunately, the race was delayed until Monday. I set my Tivo Monday morning and went to work. I prayed that our weekly meeting would end quickly. And maybe just maybe, my client would cancel their appointment. No such luck! But I had my computer on the leader board. And out of the corner of my eye, I was watching the live leader board. The race looked boring. And I later found out, it was boring. I skipped through Tivo tonight to watch the race highlights. 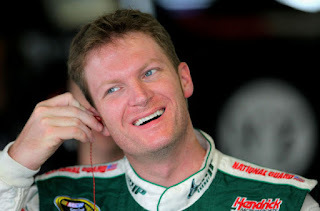 Dale Jr. started P22 and finished the race P27. I'm not sure what happened there. He went from racing in the top 10 to P27 in just a handful of laps. Super G started P3 and finished P8.